Play a Word Game with Flickr Photo tags & have fun! One cool way to exercise your brain and see some nice images from Flickr is – Photosoup. 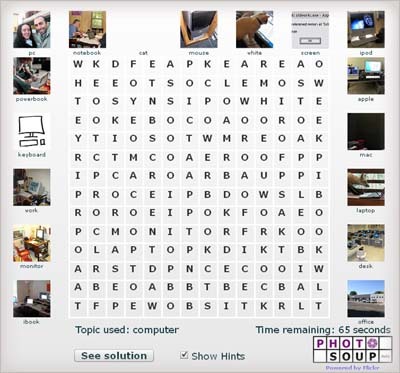 It is a visual word puzzle generator that allows users to create word search puzzles with tag-photo pairs taken from Flickr. The tag is hidden in the puzzle, and only the associated photo is shown as a clue. The objective is to find all hidden tags in the puzzle before you run out of time. To make thing easy click on show hints option. Now you willÃ‚Â have visibleÃ‚Â tags that needs to be puzzled out of words on the screen. Try to locate as many words as possible. See some beautiful images and give your brains a shakeup in an attempt to solve the puzzle. Only public Flickr photos that have the Creative Commons Attribution licenseÃ‚Â are used whileÃ‚Â generating a PhotoSoup puzzle. Very innovative idea to test your brainy side. I failed miserably in playing that puzzle as I was more interested in clicking ‘See Solution’ button… hehehe. How did you fare in solving the puzzle?